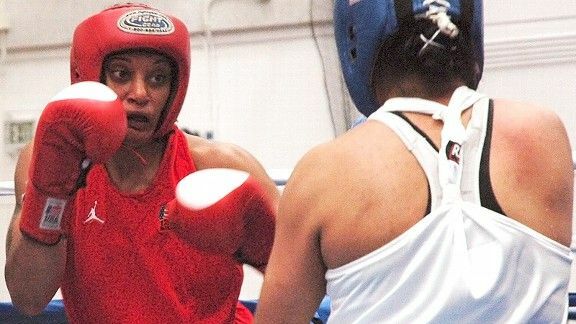 With large kudos to CNN, ESPNW and even media outlets such at USA Today, women’s boxing has been hitting the media of late — and the perspective has actually been positive. Case in point has been the skirts issues which has seen a surfeit of pieces in mainstream media running the gamut from BBC to Huffington Post. There have also been lots of profile pieces of up and coming Olympic hopefuls alongside their sisters on the professional side of the sport, as well as pieces on the world-wide participation of women in boxing from Afghanistan to India to Uganda. Here are some links to pieces. Have a read and show your support if you can. The more we advocate and respond, the greater the opportunity to keep the trend going — and maybe even find women boxing’s bouts back on ESPN, Showtime & HBO. Hmmm, about time wouldn’t you say?? « Awesome, stupendous women’s boxing 2morrow (11/20)!